Just when Theresa May's supremely unpopular Brexit deal was beginning to gain traction among recalcitrant Tory leaders, yesterday's disastrous Commons vote to hold May in contempt (and the accompanying Grieve Amendment, which effectively wrested control over deal negotiations away from May) has rendered the 'finalized' draft deal DOA just six days before a planned vote. Following May's historic defeat, cable slid to its weakest level in 18 months; but in an amusing twist, traders have apparently reconsidered the significance of yesterday's developments. Rather than increasing the possibility of a 'no deal' Brexit - a scenario that faces broad opposition in Parliament - markets believe that the odds of Brexit being called off (which Deutsche Bank put at 30% just a few weeks ago) have risen, as JP Morgan suggested in a research note, according to Reuters. JPM raised the odds of 'no Brexit' from 20% to 40%, while lower the possibility of a 'no deal' Brexit to just 10%. 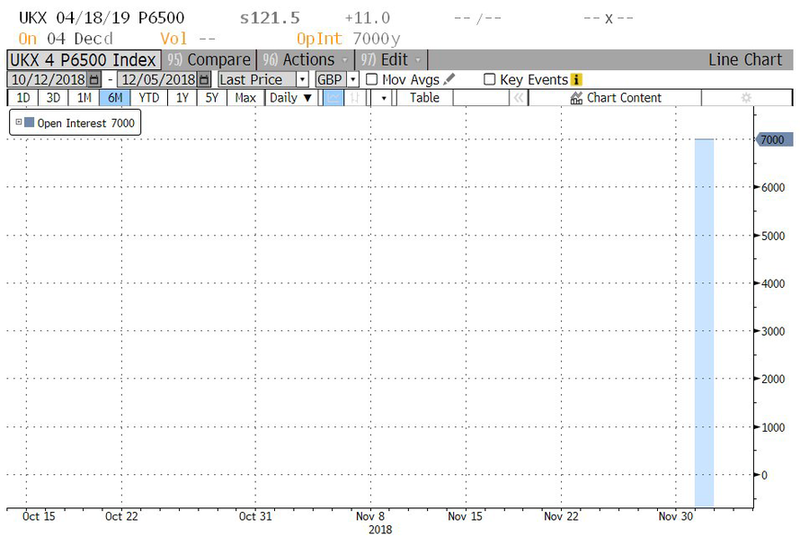 ...while six-month GBPUSD vol climbed to its highest level since 2016, reflecting a level of uncertainty that hasn't been priced in since before Article 50 had been triggered, when many still suspected that Parliament would find a way to invalidate the referendum. Theresa May herself has repeatedly said the options facing Parliament are a) her best possible deal, b) no deal or c) no Brexit. And while most traders appear to be betting on option c, at least one futures trader has placed a massive bet on a "disastrous" option b opening a massive position (7,000 contracts) in out-of-the-money FTSE puts with a 6,500 strike price (offering a expression of an investment thesis put forward by Steve Eisman, of "Big Short" fame). This bet jives with an analysis of market reactions to various scenarios published by Barclays. By publishing the AG's legal advice in full, May has been caught in a blatant cover up (since the "summary" of the legal advice didn't include the AG's most consequential finding, at least as far as Brexiteers are concerned). Furthermore, the advice has legitimized Brexiteer warnings about the UK being reduced to a "vassal state" should negotiations over a new trade deal fail and the Irish backstop is triggered. The most important text from the six-page legal advice is excerpted below, where the AG clearly explains that there is a "legal risk" that the backstop - which would leave the UK trapped in the customs union with no representation - could "endure indefinitely." "Despite statements in the [withdrawal agreement] protocol that it [the backstop] is not intended to be permanent, and the clear intention of the parties that it should be replaced by alternative, permanent arrangements, in international law the protocol would endure indefinitely until a superseding agreement took its place." The backstop would carry on "even when negotiations have clearly broken down" on a future trading relationship, Mr Cox’s paper said. "In the absence of a right of termination [on the backstop], there is a legal risk that the United Kingdom might become subject to protracted and repeating rounds of negotiations," it added. Meanwhile, remainers' cries to revoke Article 50 (which an EU court conveniently suggested could be accomplished unilaterally by May's government) are growing louder on social media. Stop the clock, put power back into UK’s hands by revoking article 50. Replace PM. Have vote on the deal or remain. UK needs to be in a financial strong position to clean Brexit. Better luck next time. Though given the magnitude of May's vote-counting blunder on Wednesday, we can't help but suspect that this is actually an example of 'controlled chaos' intended to force a second referendum, which polls suggest remainers would win (though they have been wrong before).